From 26th March 2019, Mint Street will be operating through both currency and money market instruments, with a newly emerged tool known as SWAP AUCTION which is the first of its kind. Apart from filling cash into the banking system, this will have multiple layered effects. Lower the cost of currency/interest rate risk covers would provide a way of getting foreign capital and also rationalize bond yields which would otherwise be in sync with monetary policy activities. RBI would be infusing USD 5 billion or Rs. 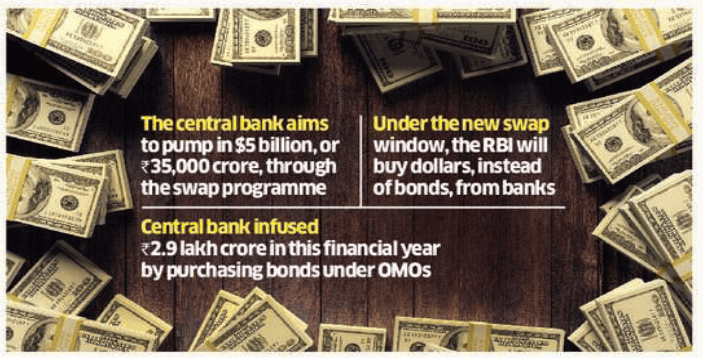 35,000 crores through this Swap program, instead of purchasing bonds and this would affect their yields otherwise. It is expected that this move would help when the financial year-end is fast approaching when banks are running short of money. It is felt that it is a novel tool which is expected to bring both forex and currency markets in sync. If all operational channels are in alignment, this should become an effect way of managing market liquidity. Banks are expected to bid at rates lower than those implied by current market rates. This in turn will make Indian Rupee costlier than the current three-year funding rates. Lower MIFOR means, hedging costs would come down which in turn would make investments in Corporate bonds more attractive. MIFOR is the cost of hedging dollar payables, which is priced over and above the spot exchange rate. The interest rate differential between India and US which his prevalent now influences the benchmark device. Such MIFOR rate of 3-year maturity is now at about 4.21% annualized and the 12-month MIFOR rate dipped about 44 bps when RBI announced the auction. Foreign investors looking at fully hedged returns would be encouraged while investing in India. The cost of one-year money for any US-based overseas investor who bets on India is now about 6.20% which includes hedging costs. India offers 7.71% average yield for one year, top-rated corporate bonds and thus there is a healthy rate differential of 151 basis points. Also, Forward premium has fallen after RBI swap announcement. One more fact is that when rupee is trending stronger against dollar, swap auction which his multi-faceted, is said to be a perfect measure, suiting the current requirement. Dealers feel that RBI’s present move is in line with its easy monetary policy stand and has resulted in a better transmission to the real economy.